Marlene Dietrich was born today, December 27, in 1901. She was a German actress and singer who held both German and American citizenship. Throughout her unusually long career, which spanned from the 1910s to the 1980s, she maintained popularity by continually reinventing herself. In the 1920s in Berlin, Dietrich acted on the stage and in silent films. Her performance in The Blue Angel (1930) brought her international fame and resulted in a contract with Paramount Pictures. Dietrich starred in Hollywood films such as Morocco (1930), Shanghai Express (1932), and Desire (1936). She successfully traded on her glamorous persona and "exotic" looks, and became one of the highest-paid actresses of the era. Throughout World War II, she was a high-profile entertainer in the United States. Although she still made occasional films after the war, Dietrich spent most of the 1950s to the 1970s touring the world as a marquee live-show performer. Dietrich was noted for her humanitarian efforts during the war, housing German and French exiles, providing financial support and even advocating their US citizenship. For her work on improving morale on the front lines during the war, she received several honors from the United States, France, Belgium, and Israel. In 1999, the American Film Institute named Dietrich the ninth-greatest female star of classic Hollywood cinema. She met her future husband, Rudolf Sieber, on the set of Tragödie der Liebe in 1923. Dietrich and Sieber were married in a civil ceremony in Berlin in May 1923. Her only child, daughter Maria Elisabeth Sieber, was born on December 13, 1924. Unlike her professional celebrity, which was carefully crafted and maintained, Dietrich's personal life was kept out of public view. She was bisexual, and quietly enjoyed the thriving gay scene of the time and drag balls of 1920s Berlin. She also defied conventional gender roles through her boxing at Turkish trainer and prizefighter Sabri Mahir’s boxing studio in Berlin, which opened to women in the late 1920s. As Austrian writer Hedwig (Vicki) Baum recalls in her memoir, "I don't know how the feminine element sneaked into those masculine realms [the boxing studio], but in any case, only three or four of us were tough enough to go through with it (Marlene Dietrich was one)." Dietrich was married only once, to assistant director Rudolf Sieber, who later became an assistant director at Paramount Pictures in France, responsible for foreign language dubbing. Throughout her career, Dietrich had an unending string of affairs, some short-lived, some lasting decades. They often overlapped and were almost all known to her husband, to whom she was in the habit of passing the love letters from her men, sometimes with biting comments. When Dietrich arrived in Hollywood and filmed Morocco (1930), she had an affair with Gary Cooper, even though he was already having an affair with Mexican actress Lupe Vélez. Vélez once said, "If I had the opportunity to do so, I would tear out Marlene Dietrich's eyes." Another of her famous affairs was John Gilbert, famous for his alleged affair with Greta Garbo. Gilbert's untimely death was one of the most painful events of her life. Dietrich also had a brief affair with Douglas Fairbanks Jr., even though he was married to Joan Crawford. At the filming of Destry Rides Again, Dietrich started a love affair with co-star James Stewart, which ended after filming. In 1938, Dietrich met and began a relationship with writer Erich Maria Remarque, and in 1941, the French actor and military hero Jean Gabin. Their romance began when both were supporting the Allied troops in World War II. The relationship ended in the mid-1940s. In the early 1940s, Dietrich also had an affair with John Wayne, her co-star in two films. Dietrich had a strong friendship with Orson Welles, who for her was a kind of platonic love and whom she considered a genius. 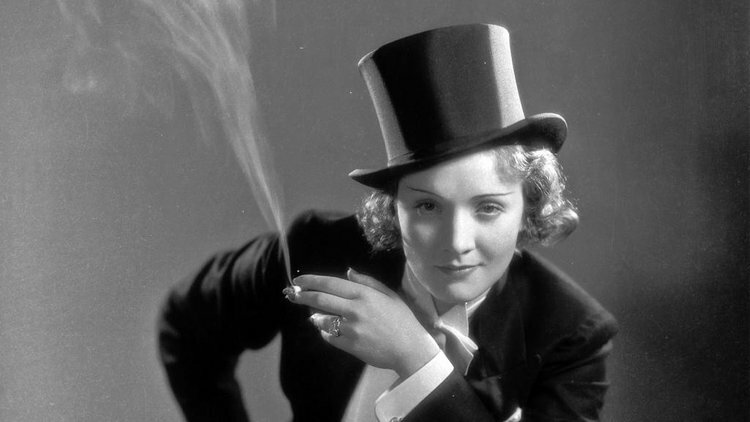 Sewing circle was a phrase used by Dietrich to describe the underground, closeted lesbian and bisexual film actresses and their relationships in Hollywood. In the supposed "Marlene's Sewing Circle" are mentioned the names of other close friends such as Ann Warner (the wife of Jack L. Warner, one of the owners of the Warner studios), Lili Damita (an old friend of Marlene's from Berlin and the wife of Errol Flynn), Claudette Colbert, and Dolores del Río (whom Dietrich considered the most beautiful woman in Hollywood). The French singer Edith Piaf was also one of Dietrich's closest friends during her stay in Paris in the 1950s, and always rumored something more than friendship between them. Greta Garbo has been commonly regarded as Dietrich's greatest film rival, but there is also a rumor of an affair between them. Her last great passion, when Dietrich was in her 50s, appears to have been for the actor Yul Brynner, with whom she had an affair that lasted more than a decade; her love life continued well into her 70s. She counted Errol Flynn, George Bernard Shaw, John F. Kennedy, Michael Wilding, and Frank Sinatra among her conquests. Dietrich's show business career largely ended in September 1975, when she fell off the stage and broke her thigh during a performance in Sydney, Australia. The following year, her husband, Rudolf Sieber. Dietrich's final on-camera film appearance was a cameo role in Just a Gigolo (1979), starring David Bowie, and in which she sang the title song. An alcoholic dependent on painkillers, Dietrich withdrew to her apartment in Paris. She spent the final 11 years of her life mostly bedridden, allowing only a select few—including family and employees—to enter the apartment. During this time, she was a prolific letter-writer and phone-caller. In 1982, Dietrich agreed to participate in a documentary film about her life, Marlene (1984), but refused to be filmed. The film's director, Maximilian Schell, was allowed only to record her voice. He used his interviews with her as the basis for the film, set to a collage of film clips from her career. The final film won several European film prizes and received an Academy Award nomination for Best Documentary in 1984. Newsweek named it "a unique film, perhaps the most fascinating and affecting documentary ever made about a great movie star". On May 6, 1992, Dietrich died of renal failure at her flat in Paris at age 90.